In the first and the second part of this series we learned how to build a web dynpro component and navigate between different views with in the component. In this part of the series we will move on to learn more complicated scenarios where one component is embedded into another component. The example consists of developing two web dynpro components Y_MOVIE_COMPOUSAGE (say this as component A) and Y_WDA_EXAMPLE_3 (say this as component B). Before dwelling into the creation of the actual application let’s get into some theory. Web dynpro components are reusable modules. 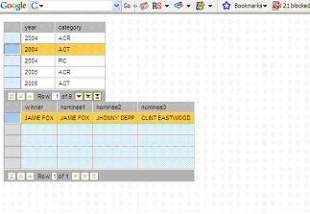 From with in a component, an interface enables you to use the data and functions of another component. 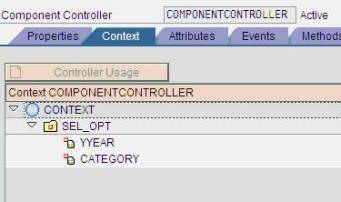 Events, methods and context nodes of the component controller can be made visible for other components, to do this mark the “Interface “checkbox to assign them to the component interface. When we mark the checkbox the corresponding nodes and methods will become a part of the interface controller of the component and available for other components to access. Now coming to the development, we will first develop a component with the name Y_MOVIE_COMPUSAGE. As we have already well versed with the creation of the component, I am not going into the details of the creation of the component. The component contains one view with the name MAIN and a user defined method GET_RECORDS which is marked as Interface method by checking the INTERFACE checkbox. 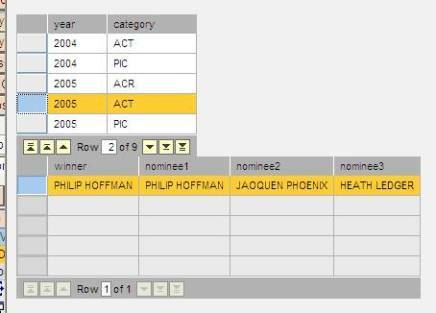 The method retrieves the data from the table YMOVIE for the given P_YEAR and P_CATEGORY. data: result_data type table of result. data: TABLE_NODE type ref to IF_WD_CONTEXT_NODE. 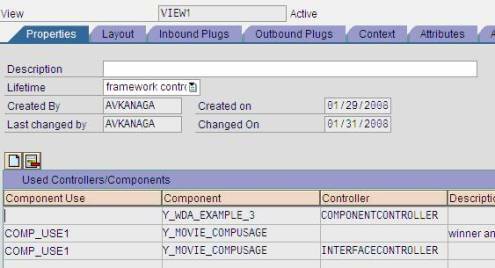 Now we built another component Y_WDA_EXAMPLE_3 which uses the component Y_MOVIE_COMPUSAGE. This component has one view with the name VIEW1. This component usage has to be defined at componetcontroller level and at individual view level. The usage is created by clicking on the create button and selecting the appropriate component and its interface controller. By declaring this we are granting the access for Y_WDA_EXAMPLE_3 component to the component Y_MOVIE_COMPUSAGE and all the interface methods and nodes. 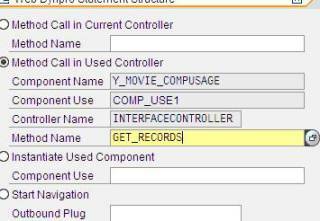 The context of the component controller consists of node SEL_OPT which has two attributes YYEAR and CATEGORY. Supply functions are methods which are used to fill the context nodes with the data. These methods are called when the elements of the associated nodes are accessed by the application. The layout of the VIEW1 contains a table and a “ViewcontainerUIElement” to embed the view MAIN of the used component Y_MOVIE_COMPUSAGE. 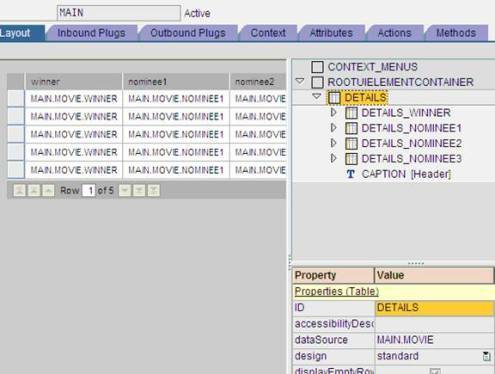 The table UI element is bound to the node SEL_OPT of the component. * to invoke a data provider. * DATA ls_parent_attributes TYPE wd_this->element_context. * static_attributes = ls_parent_attributes ). * DATA ls_sel_opt TYPE wd_this->Element_sel_opt. ** ls_sel_opt-YYEAR = 1. " sample only ! ** ls_sel_opt-CATEGORY = 1. " sample only ! * set_initial_elements = abap_true ). data: itab_sel type table of sel_cri. data: TAB_NODE type ref to IF_WD_CONTEXT_NODE. TAB_NODE = WD_CONTEXT->GET_CHILD_NODE( 'SEL_OPT' ). Every UI element in the view will have some events associated with it and we can define the events and implement the corresponding evenhandler method. 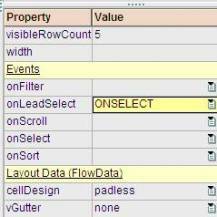 For the table element SELOPT we will define the event ONSELECT for “onLeadSelect” event. The corresponding eventhandler method with the name ONACTIONONSELECT will be added to the methods tab automatically by the system. DATA lo_nd_sel_opt TYPE REF TO if_wd_context_node. DATA lo_el_sel_opt TYPE REF TO if_wd_context_element. lo_nd_sel_opt = wd_context->get_child_node( name = wd_this->wdctx_sel_opt ). * DATA lo_nd_sel_opt TYPE REF TO if_wd_context_node. * DATA lo_el_sel_opt TYPE REF TO if_wd_context_element. 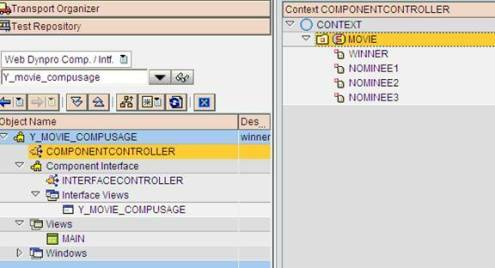 DATA lo_INTERFACECONTROLLER TYPE REF TO YIWCI__MOVIE_COMPUSAGE . After creating the web dynpro application for the component activate the whole component . For the year 2004 and category ACT the result is shown in the second table. If we select different row in the first table the result changes in the second table. I can not find “Interface Node” checkbox in INTERFACECONTROLLER. It simply is not there! I just continue from part II with my Y_WDA_EXAMPLE_2. I found it. Anyway, great guide, bu too difficult to follow as there are stepped simple steps.